The range of collapsible crates and pet carriers from Cosmic Pets are lightweight, making it easy to transport and you can assemble and/or disassemble it in seconds, making it one of the best small dog crates for puppies of on-the-go pet owners. It is made with a sturdy steel frame, surrounded by canvas and mesh fabric panels – ensuring that you pet receives plenty of light and provide airflow throughout the crate. With access doors on the top, front and side, loading or attending to your pet has just become 3 times as easy! 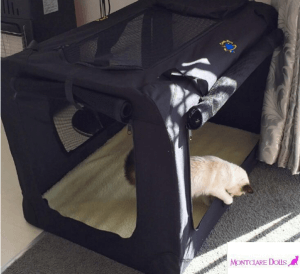 The access panels / or doors can also be rolled up and secured for pets to easily move in and out freely – when the carrier is also used as a pet bed. The material of the crate is water resistant, making it easy to wipe off any spills or messes. 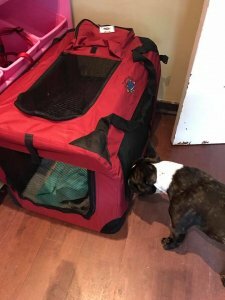 Our customers report frequently how much their pets love their Cosmic Pets carriers, where crate trained dogs often find comfort in the crate, especially during thunderstorms. If your dog isn’t a chewer, this collapsible canvas carrier a great alternative to a metal crate, as it still provides a safe enclosure without the unattractiveness of too much metal. Cesar Millan, The Dog Whisperer and several professional dog trainers have commented on the benefits of crate training. Dogs are denning animals by nature, and they value their own special place, which a dog crate can provide while also doubling as a pet bed. The Cosmic Pets carriers and crates are multi-purposed and can be used as an indoor enclosed kennel and dog bed. A dedicated, safe and comfortable space for your pup will also give your pet a sense of privacy and security as well as help keeping them off the furniture, lessen the build-up of dirt, hair, and dander in a house. The indoor kennel should be placed where your dog can still observe and be part of the family. To ensure that your dog feels part of things, place the crate in a busy area of the home where they can see and hear what’s happening. A corner of the family room, or in the kitchen are ideal places. The carrier is easy to move and assemble, allowing pet owners to leave large, clunky crates behind! Pets enjoy this home, and many choose to use it as a bed even when they are not traveling. The soft woollen fleece base is machine washable and the canvas crate can be hosed down or spot cleaned with ease. The Cosmic Pets range of collapsible carriers and crates are some of the best crates currently on the market. It is stylish, strong, durable, well-ventilated and can be used both indoors and outdoors. It is extremely lightweight so that it can be taken wherever you go and it folds flat to 7cm for easy storage. To assemble or unassembled only takes a few seconds without the need of any tools or specialised equipment. The rounded corner design will not only protect the crate itself but also your home and car interior. The crate is trendy and professional and pets and owners across South Africa love them for years! With top, side and front doors, loading your pet becomes 3 times as easy. When the doors are open and secured the crate transforms into an indoor kennel. The steel frame and fabric are extra-durable and the mesh panels makes in well-ventilated for the benefit of your cat, dog or other pet. The range is available in sizes ranging from X-small to 5XL offering you a canvas foldable crate for all your pets from small rodents to Great Danes. 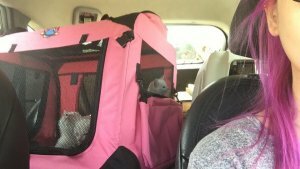 Crates will make travelling with your pet a breeze – soft crates, are used a lot by show dog and show cat people. Flexible and space-saving, soft crates are the perfect solution for show pet owners and breeders. 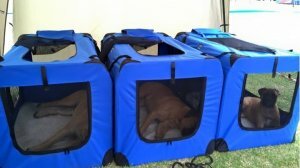 Cosmic Pets offers a range that is lightweight, durable and can be set up and folded down in seconds, requiring no tools. Best of all, when not in use it folds down to 7cm for compact storage. Our range is well represented at pet shows and a favourite with the breeder community – offering a pet house that is comfortable and mobile but also solid and spacious. During dog or cat shows your pet is required to spend extended periods of time confined in their show crate. The mesh panels ensure that plenty of air is circulated and prevents your pet from overheating. The top zippered mesh opening also makes accessing your pet during shows so much more convenient when you need to give a treat or a little cuddle without the risk of them dashing out the carrier and into the crowd. Available in a range of sizes and colours, to meet your taste and pet requirements. 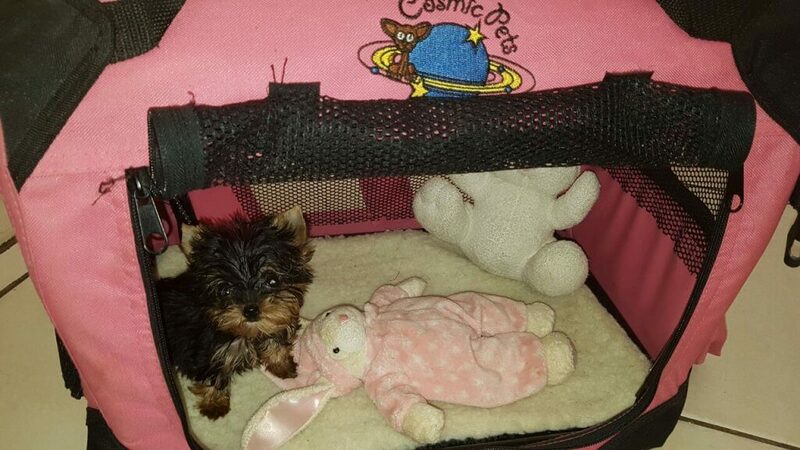 Cosmic Pets is a wholesale distribution pet accessories company and exclusively supply pet shops, vet clinics and pet care professionals such as groomers, pet sitters, boarding kennels and breeders. Our range of portable pet carriers are available through our extensive national partner network across South Africa, ensuring that you get the best service and advice on selecting the proper size collapsible crate for your pet.